Hamburgers are a crowd-pleasing entree for summer barbecues or family dinners, and it’s easy to increase the recipe for a few diners or a large group. From elaborate gourmet burgers made with Stilton and applewood-smoked bacon, or ground ginger and fried onions to traditional burgers served with ketchup and pickles, hamburgers are favored by gourmands and picky eaters alike. It’s the meat that makes or breaks a burger, but by gently handling the beef and cooking it over high heat, your patties will be grilled to perfection. Spray non-stick cooking spray on clean grill grates while the heat is still turned off. Turn the heat to high per your grill’s instructions. When working with propane grills, keep the lid open until you are sure that it is lit. Allow to heat until the desired temperature is reached. Place the ground beef in a large mixing bowl and season with kosher salt and ground black pepper. Fold the meat and seasonings together gently, using your hands. Use a light hand when handling the meat. Over-handling will result in dry, tough patties. Form the meat into a ball at the bottom of the bowl. Use a light touch. With the side of your hand, score the meat into equal fourths. Take one-fourth of the meat into your hands and gently press it together to form a round patty that is about 3/4-inch thick throughout. Repeat until you have four patties and place them on one of the plates. 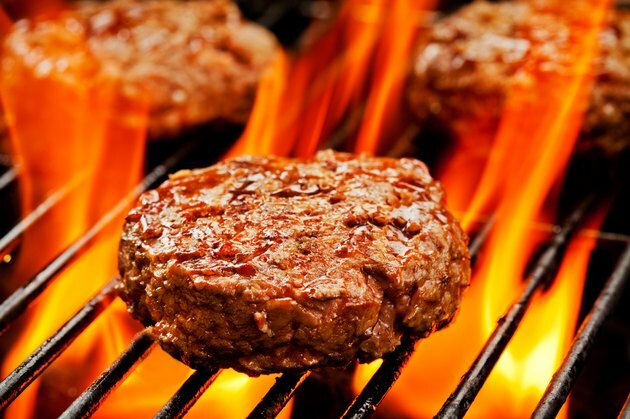 Check the grill’s temperature to see if it is ready to cook the hamburger patties. To do so, hold your hand about 5 inches above the grill. If you can do so for five to six seconds, then the grill is at low heat. Holding your hand over the grill for three to four seconds means the grill is at medium heat. When you can only hold your hand over the grill for only one second, it is at high heat and is ready to grill your hamburgers. Place each patty on the grill using the spatula. Allow them to brown on the bottom before flipping them. This should take about four minutes. Do not press the meat with the spatula as this will force the juices from the patties, resulting in dry and tough burgers. Flip the patties and grill until they are cooked throughout. This should be for about eight minutes. Place the patties on the second plate for serving. Turn the heat off according to your grill’s instructions. Flip the burgers only once to prevent the meat from drying out. The best beef to use for hamburger patties is 80-percent lean beef. For a version that is healthier for your heart, use 90-percent lean ground beef and add 2 tablespoons of olive oil for each pound of meat before making the patties. If you want to add cheese to your burgers, add a slice of your favorite variety immediately after turning the patties. Other spices, such as garlic powder, paprika, or cayenne pepper can be added to the salt and pepper seasoning when making the hamburger patties. Always wash your hands and sterilize work spaces after handling uncooked meat to prevent foodborne illnesses. Never leave a fire unattended. Keep children and pets away from the hot grill to prevent burns. Consuming undercooked meat may lead to foodborne illnesses. The U.S. Food and Drug Administration suggests an internal temperature of 160 degrees Fahrenheit for ground beef. If you smell gas while cooking, immediately turn the grill off and close the valve on the propane bottle. Consult a professional before using the grill again.